One of the first perennials to bloom in my zone 5 garden is Old Fashioned Bleeding Heart, Dicentra spectabilis ‘Alba’ as well as the pink version. 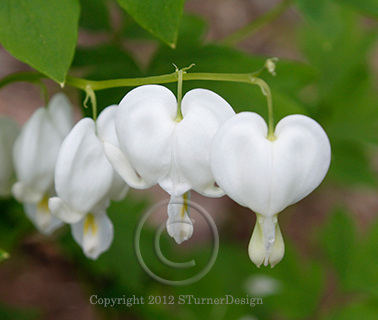 The tiny heart shaped flowers dangle in beautiful rows announcing the arrival of spring. They are especially lovely when covered with water droplets from soft April rain showers. This easy to grow perennial needs full to partial shade and will go dormant later in summer unless kept moist, so plant it behind other shade perennials such as hosta or ferns for a beautiful combination.